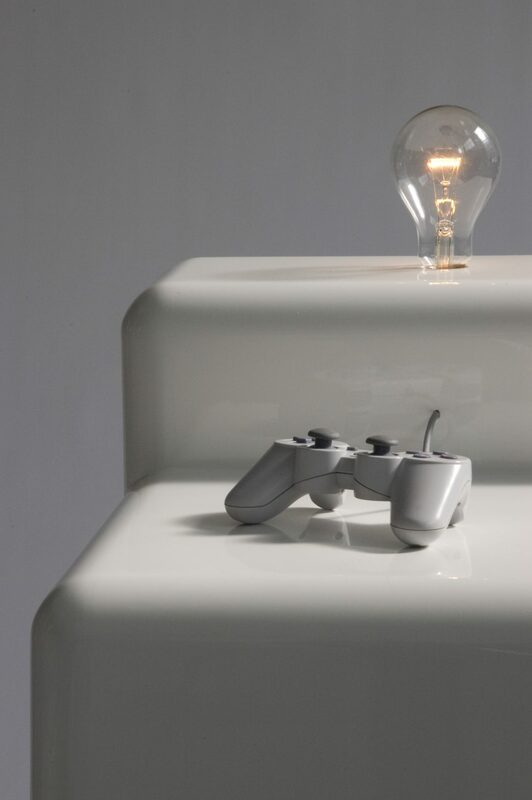 The hard wired connection between a light bulb and the designed interaction with a game controller is the main topic of the sculpture “Verstärker” (Amplifier). In this way the daily use of electric light is addressed by the very abstract work. At the turn of the nineteenth century the light bulb was a symbol for the growing belief in technical progress. Also, the light bulb is just simply a symbol for light, spirit, and idea. In the work “Verstärker” a light bulb is used as a feedback media. The usual displays, like monitors or colorfull flashing displays are reduced to a bulb, which turns on and off, to one pixel, becoming lighter and darker. This reduction is effected with regard to the input media. The controller of the PlayStation becomes the real attraction of this pice, because of its tangible and sculptural qualities. The flashing lights, known from the world of computer games are not just follows the purpose to allure people into gambling halls as eye catchers, but most of all to enhance dramatic moments in the game. The flashing light/dark light therefore intensifies the sensuousness of the video game. By playing with “Verstärker” it becomes clear, how much quality this effect has, at the same time, computer games are critically examined as superficial light games.